A bicycle trip to the farmer’s market is a perfect way to begin the weekend. Fresh air, exercise, a feeling of community and local food. Saturday morning, Greg and I met up with Arielle (of the newly-formed Bicycle Goddess Brigade) to ride our bikes to Chicago’s Green City Market. What a happy scene – dozens of bicycles were locked up outside the market and many bicycling families went by with kids in bike seats, trailers and on their own bikes. In general, I think people who ride bikes are the type of people who shop at farmer’s markets. Also, a bike trip to the farmer’s market is a pleasurable weekend activity for people who bike only occasionally. Total daily mileage = 14. How is the farmer’s market scene where you live? Do you have access to fresh local food and, if so, do you see a lot of fellow bicyclists there? Some readers asked for more information about the shopping trip I made with the De Fietsfabriek Bakfiets. I’m happy to oblige. As I mentioned before, last week I ran into my friend Elizabeth talking to the shop owner, Jon. When I commented on how cool the Bakfiets looked, he said I could borrow it, if I ever needed to. My ears perked and I soon took him up on the offer for a trip to Costco. Such is the life of a car-free bargain hunter. For those who are not familiar with Costco, it’s a store where you can buy products in bulk for incredibly low prices, after paying a modest annual membership fee. Everything is really big there. I recently joined to reduce our household grocery budget, after I realized they carry many of the organic products we like. These pictures don’t portray the full magnitude of the shopping trip. I filled the super-sized cart with stuff like 12-pound bags of rice, 5-pound bags of frozen broccoli, gallon jars of artichokes, and 24-count cases of bottled micro brew. Mr. Dottie kept saying that there was no way everything would fit in the bike. 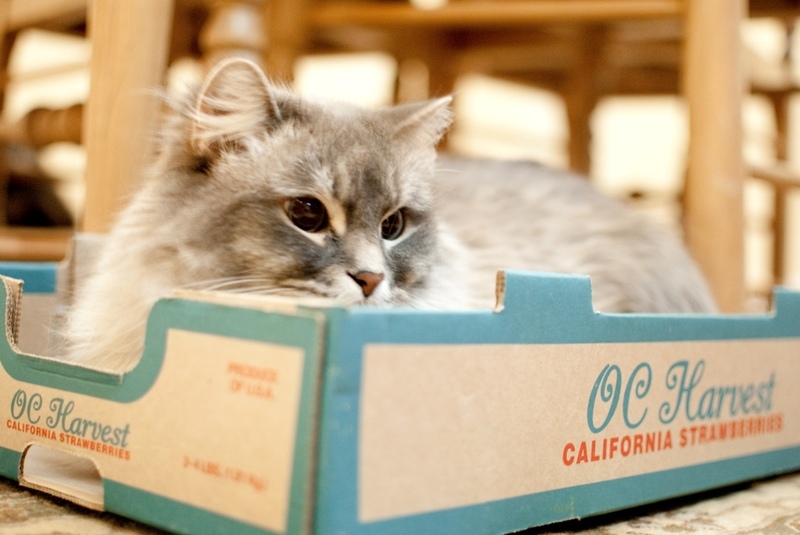 Once we wheeled everything outside and prepared to load the box, I, too, began to worry. A few minutes later, however, the cart was empty and the box still had room. I don’t think we could have fit it all in the trunk of mid-sized car! With the Bakfiets set in 2nd gear, the ride home was slow, but did not require much more effort. Discovering how much a bike could carry was an eye-opener! 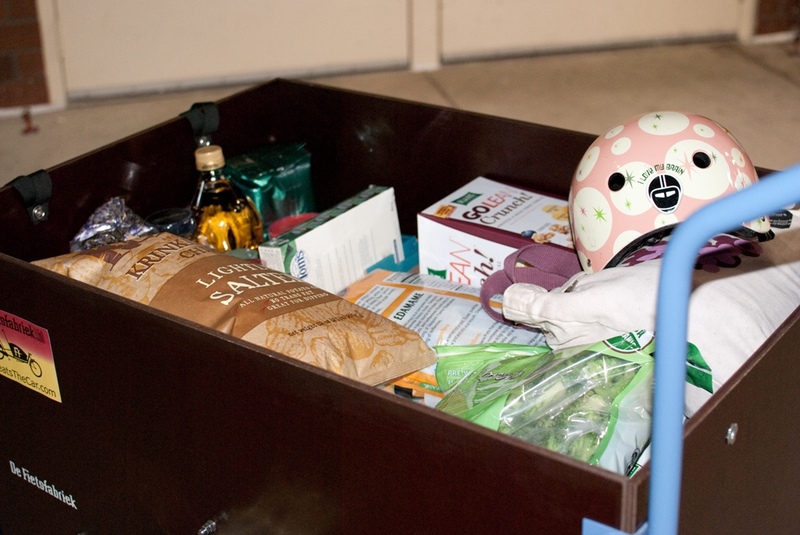 We’ve discussed grocery shopping on a bike before, but this takes it to a whole ‘nother level. Anyone else make trips like this by bike? Or carried other kinds of large loads? I’ve never posted about grocery shopping on my bike before, because I live very close to a grocery store and simply walk. In these tough economic times ™ I decided to head up the road a bit and see what good stuff (i.e. beer and wine) I could find cheaper at Trader Joe’s. As expected, all my purchases fit with no special panniers. For the weight she was carrying, Oma rode smoothly. There was a barely perceptible squirrely-ness to her front handling – a slight but constant shift side to side in the handlebars. If I had to bike to get my groceries on a regular basis, I would either make more frequent trips, drag Mr. Dottie with me, or buy less beer and wine (maybe). 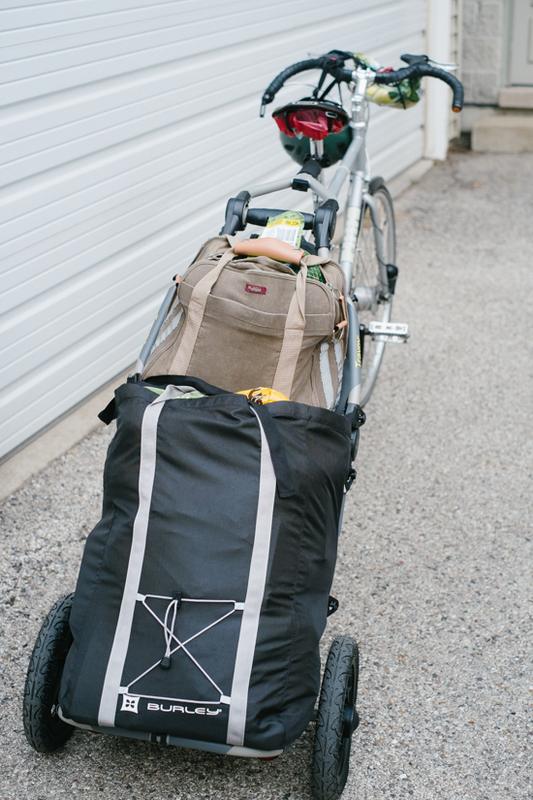 I’d also buy some special grocery panniers. 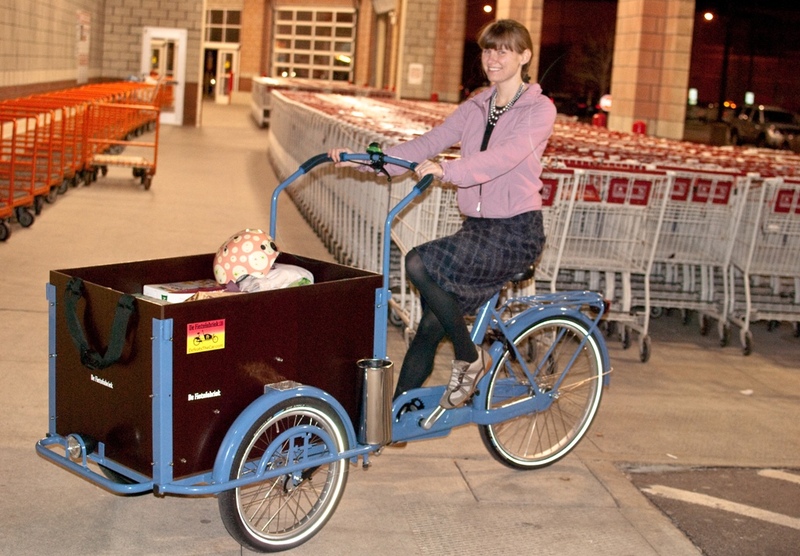 I imagine grocery shopping gets more logistically complicated with a kid or two, but then I would have an excuse to buy a bakfiets. 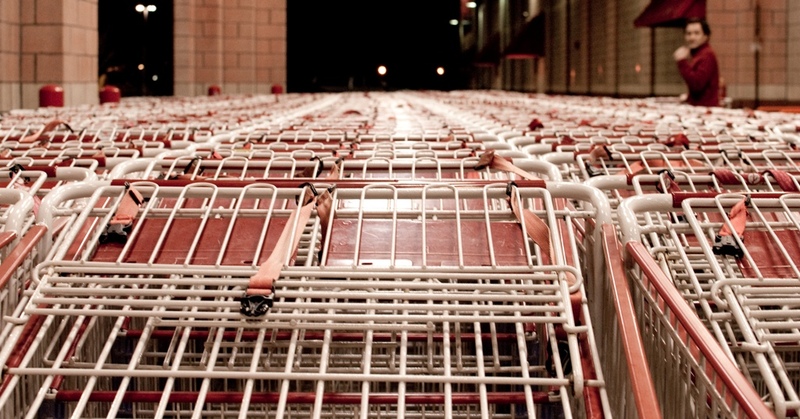 Anyone else grocery shop without a car? Silly question – I know lots of you do! What’s your method? This is the first part of a four-part series on vintage style. In part two, Trisha will discuss her vintage style and share some of the best places to find vintage items online. Part three will provide tips for buying vintage bicycles and the pros and cons of ownership. Finally, part four will profile a founder of a vintage shop who gets around the city on her vintage trike. Why are we devoting a series to vintage style on a bicycle blog? Vintage style and bicycling have a lot in common! They are both sustainable, budget conscious, individual and fun. 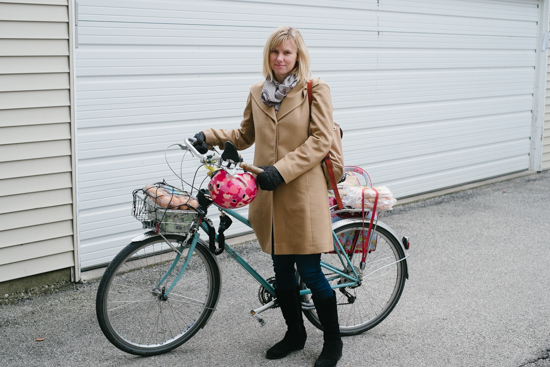 It’s no wonder so many bicyclists—including Trisha and me—gravitate toward vintage and thrifted fashion. Cycling is quite prominent in London, although the city obviously has a long way to go. The narrow streets, huge double-decker buses, and tiny speeding cars present special challenges for cyclists, but many Londoners are up for the challenge. Walking down the main streets downtown, I watched several cyclists go by each minute. A lot had sportier bikes and special gear, but the vast majority looked quite stylish. I saw a few Pashleys and some Dutch bikes, as well. I took as many pictures of interesting cyclists as I could manage whilst site-seeing. I don’t know how Riding Pretty, Chic Cyclist and others do it so well, because it’s been hard for me to hit a moving target. My favorite find was this lovely lady on a Dutch bike. Love the flowing locks! Thanks a lot, Prince! You forced me to shop at Target for the first time in a long time. The 2 miles surrounding my home has everything I would ever need to buy: bikes, books, music, wine – you know, the basics. So when Greg suggested that we swing by Target today, I was highly resistant. Once I heard the reason, however, I had to oblige. Prince is his favorite singer (he has fond memories of pedaling around his family’s farm blasting Sign o’ the Times on his Walkman) and the new album is being sold exclusively at Target. sigh. I don’t hold a grudge against Prince; he’s doing what he has to do and getting by without a record label, which is great. Good for him. But still – Target? I guess I should be thrilled he did not choose Walmart. One of my favorite things to do on the weekends these days is make the rounds of the neighborhood shops on my bike. It’s never a long ride — 4 miles roundtrip, max — but it’s relaxing, and going on Le Peug keeps me from buying too much. I especially like visiting the thrift and antique stores in the area since I’m always looking for a bargain. Say Hello to the Future – Rivendell's Betty Foy! Along with the gorgeous mast that Trisha designed, we’ll soon have a new addition to Let’s Go Ride a Bike. My decision is made, finally! Long-time listeners may remember my first steps to finding a bike to replace my stolen Jamis. I oggled bikes the I could not afford, such as ANTs and MAPs. I encountered annoying bike shop guys. I toured Chicago’s bike shops. At one point I thought I had something on the horizon, but that did not work out. After (almost too) much thought, I’ve decided that I will purchase the Rivendell Betty Foy. This was one of my original loves that’s pretty much perfect and reasonably in my bike budget (which, by the way, comes completely from selling my car and renting out my garage parking spot). Say Hello to the Future – Rivendell’s Betty Foy! I’ve always loved sidewalk chalk. It would be fun to use these on a group ride as shown, but I also like the idea of putting one on for my commute. Unfortunately it looks like it’s just a concept for the time being. I have a confession to make: I’m not sure one bike, even one as lovely as the Batavus, is enough for me. I used to think bikes were like men — you find the one for you, and that’s it (or so they say). Now I know that they are more like shoes, or maybe coats: there’s the right choice for every occasion. 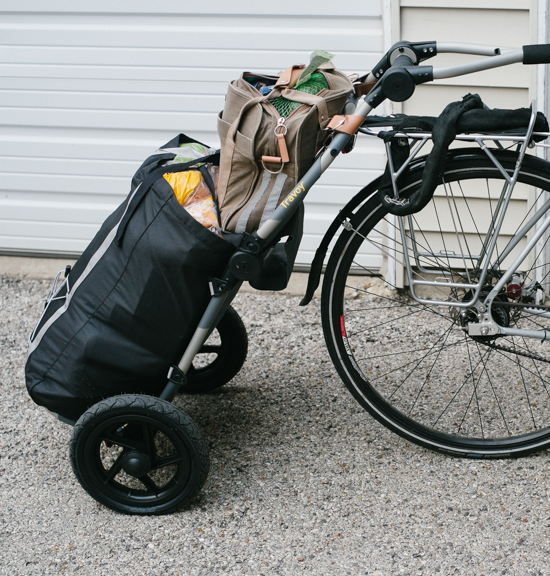 One day you’re feeling sporty; the next, you might want to haul groceries home. And what if someone comes to visit and needs to borrow a bike? It doesn’t help that they’re all so beautiful in different ways. This is the long way of telling you that I’m cheating on the Batavus before he’s even made it home (such a vixen). But it wasn’t my fault! Had Pinkie not been taken from me, I promise I never even would have looked at another bike — or at least, not with my wallet in hand. However, among the many kind comments on the entry about her theft was one from Jon at Grinder Bikes, who offered to lend me something to ride until May. I clicked on over to his site and noticed he’d rebuilt many lovely bikes out in Denver. I’d fallen for a few vintage bikes during my bike search, but they were always too large for me. Maybe he had something suitable? Maybe he has a mixte, whispered the devil on my shoulder. So I asked the question.